Lung cancer is one of the most common types of cancer. It’s also one of the deadliest, accounting for one of every five cancer deaths. In 2018, that number topped 150,000. More people die as a result of lung cancer each year than from breast, colorectal and prostate cancer combined. Despite these scary statistics, American Cancer Society researchers found that fewer than 4 percent of people who qualify for lung cancer screenings ever get them. Low-dose computed tomography, or a low-dose CT scan, is the only recommended screening test for lung cancer. It’s the only way to find the earliest stages of the disease, when there are no outward signs or symptoms and the cure rate is high. The symptoms –cough and shortness of breath – don’t appear until the disease is advanced. In 2013, the U.S. Preventive Services Task Force began recommending that certain people at high risk for lung cancer – mostly current and former smokers – have annual low-dose CT scans to screen for the disease. A recent study showed that if everyone eligible underwent screening, up to 12,000 lung cancer deaths a year could be prevented. Read how a low-dose CT scan saved Gary Plog's life. It’s important to note that the amount of radiation involved in a low-dose CT scan is very small and similar to that of an annual mammogram. 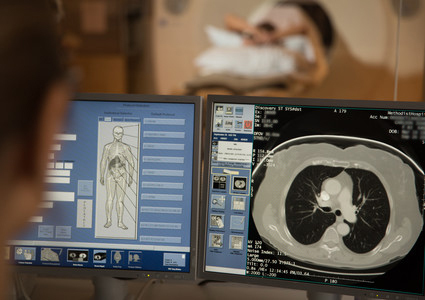 A low-dose CT scan screens for abnormalities in the lungs that may be or become lung cancer. Nodules in the lungs could be an early sign of lung cancer, but not all nodules are. Here in the Midwest, we have a lot of fungus in our soil, so nodules are extremely common. About 97 percent of the people we screen have nodules, and they’re benign. Determining what’s serious and what’s not depends on a specific set of guidelines set forth by the International Early Lung Cancer Action Program. Those recommendations generally depend on the size of nodules and how they look. Patients may need to undergo additional testing, which could include a follow-up CT scan, a biopsy or a PET scan. Those tests will help determine if the diagnosis is cancer. If a small lung nodule is found to be a cancerous, the cancer can be cured more than 80 percent of the time. This is why screening is so important. If you have a history of smoking, talk to your primary care provider about whether you should consider a low-dose CT scan. Your provider will discuss your options, the risks and recommendations. For more information, about low-dose CT scan, contact the Methodist Estabrook Cancer Center Lung/Thoracic Oncology Clinic at (402) 354-5858, or the Methodist Jennie Edmundson Lung Mass Clinic at 712-396-7250. Methodist has been a recognized lung cancer screening site since 2001 and was the first hospital in the region to participate in the I-ELCAP trial starting in 2006. Designated as a lung cancer screening center of excellence by the Lung Cancer Alliance, Methodist is one of only 250 such sites across the country. As program manager for the Methodist Lung/Thoracic Oncology Clinic at Methodist Estabrook Cancer Center, Deborah Meyers, RN, BSN, OCN, is passionate about providing comprehensive, compassionate, quality care during the diagnosis and treatment of the disease. Her program utilizes the expertise and experience of specialists in thoracic surgery, pulmonary medicine, medical oncology, radiation oncology, pathology and radiology to provide a full range of services in the prevention and treatment of lung cancer.